For the very first time, Punjab University has broken all the record by enlisting into the top 400 club in the Times Higher Education (THE) World University Rankings for the year 2014, well ahead of the four IITs. The university has been crowned as India’s top varsity and is placed at 32nd position among Top 100 Asian universities. 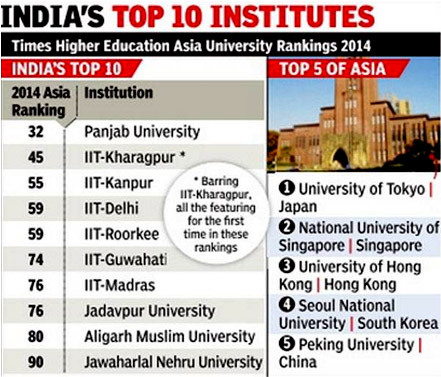 The Times Higher Education on Wednesday released the BRICS & Emerging Economies Rankings 2014 by placing Punjab University at rank 13, ahead of six IITs – Kharagpur, Kanpur, Delhi, Roorkee, Guwahati and Madras. The University of Tokyo tops the list of Asian university rankings. PU scored 40.2 points with research citations topping the list of five indicators in the Asia rankings. Moreover, PU’s research credentials score of 84.7 tops all the Asian universities, indicating university’s worldwide influence in research. It also scored well in teaching, international outlook, industry income and research. Around 21 universities in India took part in the (THE) ranking. None of the universities from Indonesia, the Philippines or Pakistan figure in the ranking.